What is Espresso? Or Is it Expresso? Espresso, which originated in Milan, Italy circa 1900, is a very dark, bitter Italian coffee often mispronounced expresso. 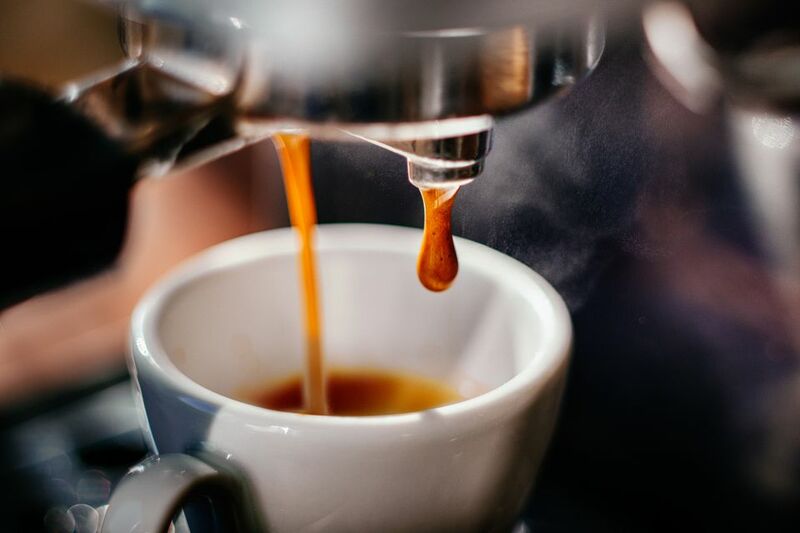 The term espresso comes from the Italian meaning "pressed out," referring to the process of pushing the freshly fine-ground bean essence through a special machine using steam and water. This process creates a highly concentrated brew with a thin layer of creamy, dark beige froth on the coffee's surface. Since it is highly concentrated, espresso contains more caffeine by volume than regular coffee. People looking for a boost of energy often refer to using a "shot" of it for a pick me up. The difference between espresso and coffee is the fineness of the grind and the time it takes to brew the drink. Espresso is made from ground coffee beans, so it's thicker and can be made much quicker than coffee, also called drip coffee. It takes up to 30 seconds to make espresso depending on the machine being used, but drip coffee can take anywhere from three to five minutes to brew. Espresso is highly concentrated, so it is usually said that it has more caffeine than a cup of coffee, but that is not true. While it's true that espresso has more caffeine per volume, that is there's more caffeine in an espresso shot, usually an ounce, than there is in an ounce of coffee. People don't drink an ounce of coffee. They drink a cup of coffee, usually anywhere from 8 ounces up to 24 ounces thanks to all the modern coffee shops that sell large cups of coffee. When you consider the serving size of drip coffee, it contains much more caffeine than a single serving of espresso, which is usually just an ounce. Even a small cup of coffee has more caffeine than a shot of espresso. Whoa, Why Is My Mustard Hot and Spicy?